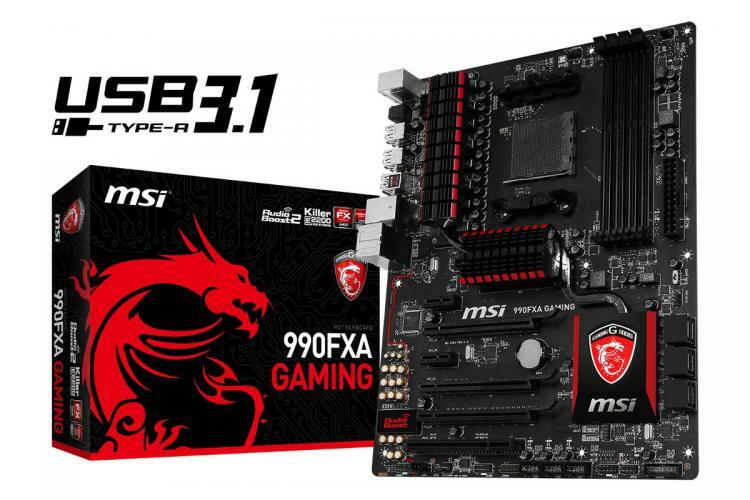 MSI, world leading in motherboard design, debuts the world's first USB 3.1 featured AMD GAMING motherboard, the 990FXA GAMING. Delivering blazing fast USB performance, up to 2 times faster than USB 3.0, the new 990FXA GAMING motherboard offers two USB 3.1 ports, which are fully backwards compatible with USB 3.0 and USB 2.0 devices. Inheriting the outstanding DNA of MSI's award winning GAMING family, the new MSI AM3+ 990FXA GAMING motherboard features Killer LAN for the best online GAMING experience, Audio Boost 2 powered by Creative Sound Blaster Cinema 2 for astonishing sound quality that gives you the upper hand on the battlefield, USB Audio Power and a completely new hardware and software design for enhanced gaming performance. Get ready for high-end AMD GAMING with MSI. USB 3.1 allows for speeds up to 10 Gbps, doubling the speed compared to USB 3.0 and 20x faster than legacy USB 2.0. USB 3.1 is even faster than SATA III! Transferring your favorite games, albums and movies over USB has never been faster. The new 990FXA GAMING motherboard features 2 front USB 3.1 connectors for more convenience. Whether you are a casual or professional gamer, network lag kills. MSI GAMING motherboards feature Killer high-performance networking and provide the highest level of control and network speed for video streaming and gaming. A Smooth, stutterfree network is a must in today's world of online gaming, where a single packet of network data can make the difference between a win or a loss, Killer makes sure that it arrives. MSI Audio Boost 2 takes on-board audio to the next level. Powered by Creative Sound Blaster Cinema 2, Audio Boost 2 combines a revolutionary hardware layout for audio on the motherboard with the best customizable audio options like Multi-Channel Speaker Calibration and headphone profiles that dramatically enhance your audio experience. The Sound hardware is not only EMI shielded and separated from the motherboard, the power to the high quality amplifiers and audio components is delivered through ultra stable design. Ensuring clean power delivery for the audio components combined with the electrical shielding provides the highest level of on board audio ever experienced. The MSI 990FXA GAMING motherboard is optimized for multi-GPU use with enough space between the PCI-Express slots for optimal airflow for your graphics cards. That way, there is no need to worry about heat issues and you are ensured to enjoy the best graphics at the highest framerates jumping off your screen when running an NVIDIA SLI or AMD CrossFire gaming setup. The new 990FXA GAMING motherboard is the world's first AMD motherboard to fully support the next generation in storage control, NVM Express. The 990FXA GAMING motherboard supports NVMe devices as primary storage under Windows 7 64-bit and Windows 8.1 64-bit and fully support NVMe booting. Enjoy lower latency, lower power consumption and increased transfer speeds with MSI and NVMe. MSI continues to showcase its love for GAMING products by crafting each GAMING motherboard to perfection. From the inspiring new heat sink with GAMING DNA, a cleaner layout around the CPU socket, matte black PCB across the entire line-up and impressive M-Shield I/O panel cover, it's an inspiring sight for gamers. Details make all the difference. 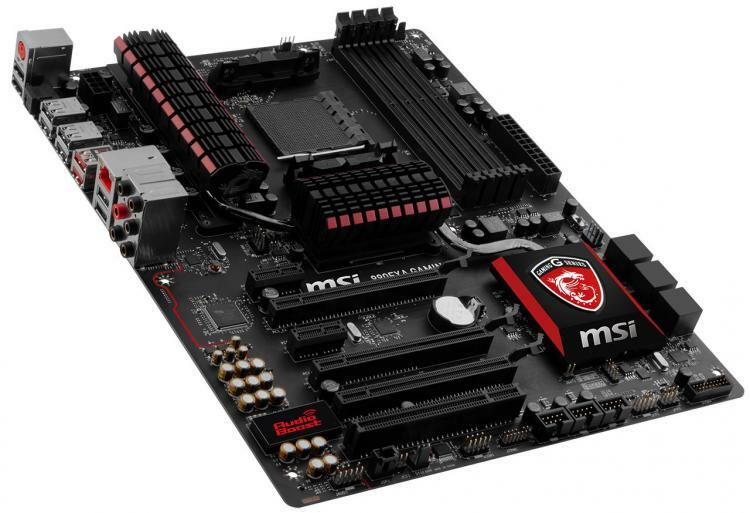 MSI uses award-winning Military Class 4 components. Military Class 4 is the next step in high quality components. Hi-C CAPs, Solid CAPs, Dark CAPs, together with SFC and Dark Chokes, ensure your PC runs stable under extreme conditions. These key components have all passed extreme testing, ensuring stable operation in the harshest environments. The core of Military Class 4 is based on GuardPro, a set of tools which increases your stability in the most challenging conditions, featuring ECO power, circuit protection, humidity protection, high temperature protection, EMI protection and ESD protection. ECO power features MSI ECO Center which allows you to physically cut the power to unused chips to reduce power usage up to 29%.